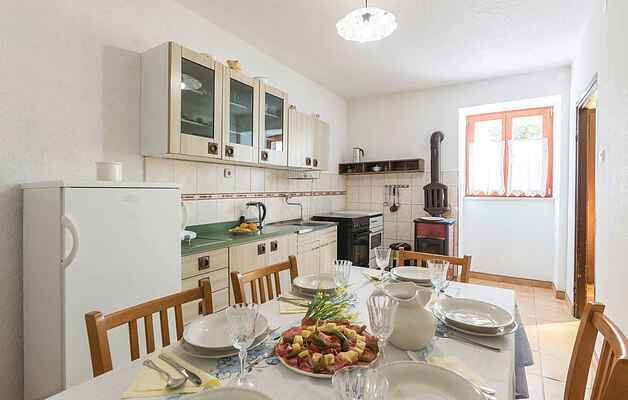 This holiday house, built in the typical Istrian style, is located in a peaceful and rural area, where you can recover from everyday stress. Air conditionings ensure pleasant temperatures, during the hot summer days in the interiors, which are equipped with old and modern furniture. Enjoy the get-together on the terrace overlooking the beautiful landscape, where your children can play undisturbed on the fenced plot. Behind the house, on an unfenced part of the plot, there are sunbeds available as well as an outdoor kitchenette with barbecue. Experience numerous bathing pleasures at the many bays and beautiful natural beaches in the immediate vicinity.